A few weeks ago, I bought a new toy for myself…the Veggetti Spiral Vegetable Cutter . This nifty little gadget allows me to very easily turn whole zucchini into lovely, uniformly shaped zucchini noodles in just a few seconds. This is a lot easy that performing this task with my mandolin slicer, and it’s really quite fun. Eager to put my Veggetti to the test, I whipped up this deliciously fresh and light Zucchini Noodles with Creamy Lemon Chive Sauce Recipe. I made it as a quick, no-cook side dish to a Sunday brunch, and it was excellent. Very light, lemony, and simple, it came out to just 2 Points per serving. I can’t wait to play around with the Veggetti and see what other great new Weight Watchers Recipes I can create! 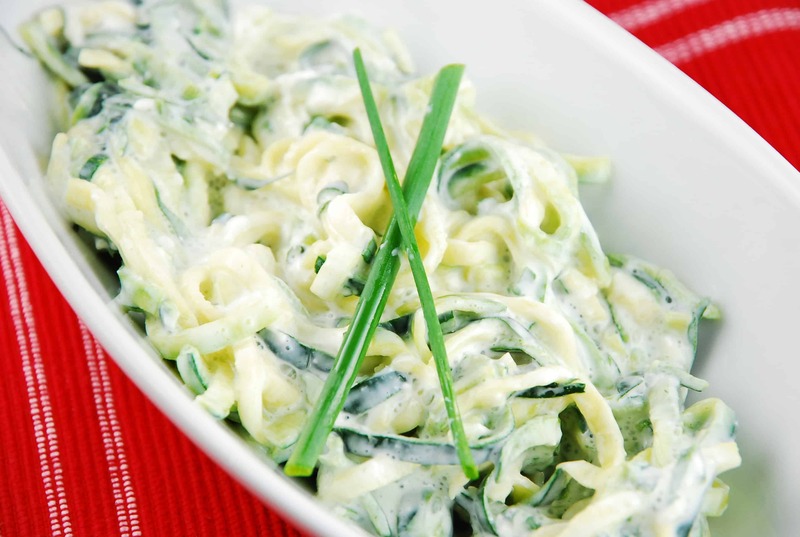 Fresh, light and delicious, these low calorie zucchini noodles are tossed with a bright, creamy lemon chive sauce and make a wonderful addition to just about any meal. Perfect for an Easter Brunch side dish recipe! In a small bowl, combine all ingredients except the zucchini. Mix well. Cover and set aside. Using a mandolin slicer or Veggetti, slice zucchini into long thin, noodle-like strips. Place in a medium sized bowl and toss with sauce until zucchini noodles are evenly coated. Serve immediately. This was wonderful. I didn’t have sour cream and used all greek yogurt, but we all loved it. So light and fresh, a wonderful addition to our meals! Not at all….I used the sour cream because I prefer the taste and texture to that of Greek yogurt, but either option will work just fine. Thanks for the great recipe. My family loved the light lemony sauce. Raw zucchini noodles are delicious and a nice change from steaming or sautéing the vegetable. Can you cook the zucchini? Will it taste good that way? I think if you cook them, then let them cool it would be ok. But I don’t think it would taste too good with warm zucchini noodles in this particular recipe. The zucchini doesn’t need to be cooked?